The Double K Groomer’s Edge Belt Mounted POWER CLIPPER is superior to any other clipper! The Double K Groomer’s Edge POWER CLIPPER was rated "Best Body Clipper" by John Lyons in Perfect Horse Magazine. The Double K Groomer’s Edge POWER CLIPPER cuts easily through thick, dense or dirty hair while operating very quietly -- in virtual silence at low speeds! With five times the power of conventional clippers, the 1/8 horsepower POWER CLIPPER cuts faster and smoother than any other clipper. Body clip your horses in a fraction of the time it would take with other clippers. Eliminates time-consuming and unsightly clipper tracks and streaks. The variable speed control offers speed adjustments from 100 to 4500 RPMs. With 9000 blade "strokes per minute" and the greatest range of blade motion in its class, the Power Clipper is unsurpassed in fine clipping capability. 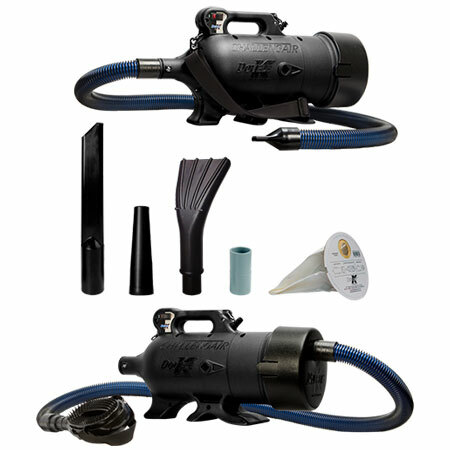 It's unique cable drive system transfers power from the motor to the handpiece allowing the handpiece itself to remain cool during clipping. 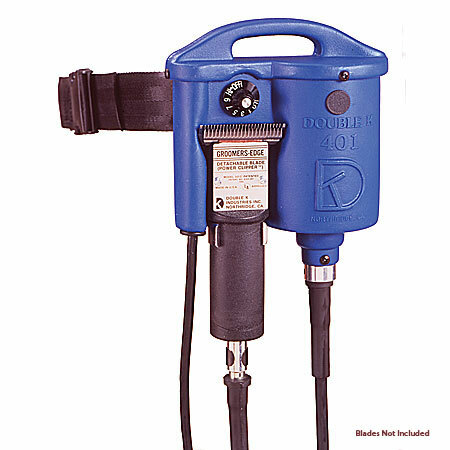 The "quick detach" handpiece allows for optional hoof polishing or leather/silver polishing handpieces to be installed on to the power cable for great versatility. The Double K Groomer’s Edge POWER CLIPPER handpiece is impact resistant and accepts all "snap on" style blades. The clipper speed may be turned down to trim a bridle path or to work around horses’ ears in essential silence. This is a very important feature when working with young or inexperienced animals. The motor of the Belt Mounted POWER CLIPPER fits snugly at the hip and attaches to the enclosed, adjustable belt or may be attached to almost any belt. The cable length is 6 ft to accommodate even the longest reach without being cumbersome. In the event your Double K Groomer’s Edge POWER CLIPPER ever needs service, Double K has authorized service centers located strategically throughout the United States. The Double K Groomer’s Edge POWER CLIPPER has a one-year limited warranty and a three-year motor warranty.